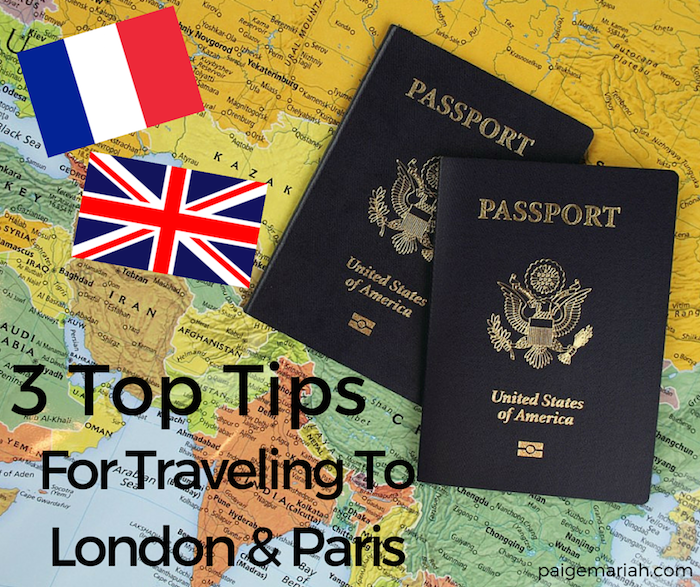 My Top 3 Tips For Traveling To London & Paris! I could probably go on and on about my first big international trip to London & Paris forever. However, I’ll spare you all and just suggest you check out my vlogs after you finish reading this post! With that being said, there are also a ton of tips that I could think of sharing for other first time visitors, but I thought that I’d choose a top 3 that I believe are super important but are often forgotten! Click through to check out my top tips! As I’m sure you may already know, London and Paris use different currency than the US. London accepts Pounds and Paris accepts Euros! My family decided to purchase currency for both countries in advance through their banks and had it delivered to our home a few weeks before we left for our trip. However, after doing a little bit of research online, I decided against going that route. I found out that my bank (Bank of America) has partner banks in both London and Paris and if I made sure to visit only their ATMS, I would avoid the fee that you are charged when visiting ATMS outside of your own. Plus, when purchasing currency ahead of time online, not only do you have to consider the exchange rate, but you have to purchase at least $100 of that currency! If your bank has an international partner bank where you’re visiting, take advantage! I’m probably the only person who didn’t take this seriously when I first heard about it, but yes, the outlets really are different in London and Paris than they are in America! I had been warned, but I just naively assumed that our hotels would guarantee a way for American visitors to charge their electronics….nope. You will need to purchase international outlet adapters before you leave or once you get to your destination. My father bought one ahead of time, but there were 4 of us, so we had to buy 3 more the first day that we arrived in London. There are even all-in-one adapters that you can purchase online that fit the plugs of all the most commonly visited countries. This is a necessity if you want to avoid walking around your entire trip with a dead phone! I’ve never in my life been so desperate for wifi as I was on this trip. Though I missed having my snapchats posted immediately, it was mainly because I really needed GPS to get around! Luckily, before we left, we purchased AT&T international plans for $30/$60 that came with unlimited text, 300 MB of data and access to all available hot spots in London and Paris. Now 300 MB is nothing to me...I can run through that in a few hours. So, paying the extra $30 for the wifi hot spot access was super important. Unfortunately, it wasn’t as reliable as I would have hoped but I was happy to have it when it did work nonetheless. I hope that you all found these tips helpful! If you've visited London or Paris, what tips would you include? Let me know in the comments!